When you arrive at the page, there are several mothods to conduct a search for a case or a particular collection of cases. The instructions below correspond to the image below. Permit Number: Enter the Permit Number and click on "Submit." 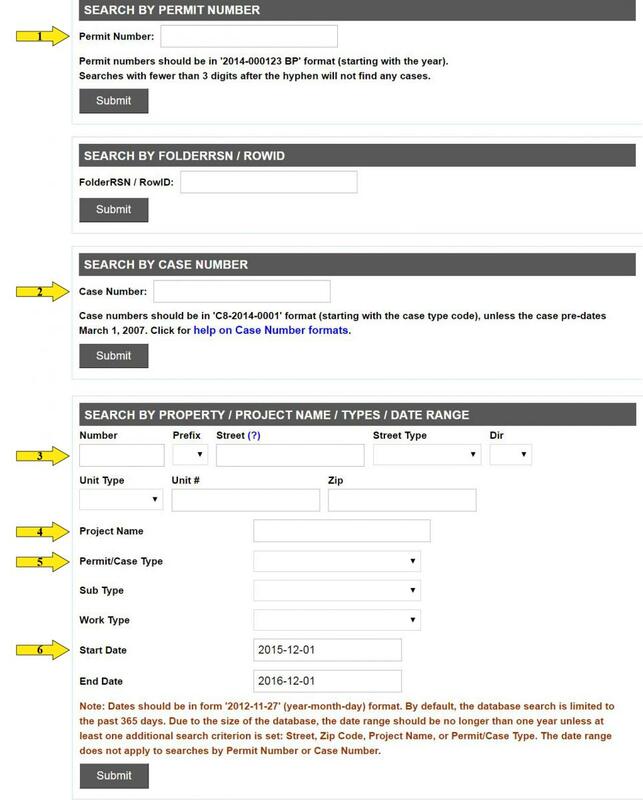 Case Number: If you receive a notice in the mail about a project near you, enter that Case Number here. Click on "Submit." Address: Use just the street name if exact address is unknown. Project Name: Does not have to be exact or complete. Permit/Case Type: Click on drop-down arrow and select type. If needed, use drop down menu for "Sub Type" and "Work Type"
Start Date/End Date: Enter an estimated permit/project start date. The End Date will auto-populate to the current date. Hit "Submit" at bottom of page. For more detailed explanations of the various functions of this software, click on the “Web Help”link toward the bottom of the left-side green bar on this page. Blank Box=entire number is the same as Permit/Case number; one=no reference file name for this permit/case type. Not all Case Types and SubTypes are listed below-only the most commonly searched. Formats below apply to the number in the Reference File Name column of the online record. For queries, you may use the % symbol as a wild card anywhere in the number, as many times, particularly at the end of the prefix and at the very end of the case number. There are too many variations to list here. For Descriptions of document images (under Folder Attachments): the ~### refers to Sheet # of the applicant’s drawings that have been scanned and posted online. Please read Sheet ~001 to see the index of sheets. Any (#) notation following the Sheet # refers to a modified sheet, and the highest (#) of any page is the latest revision of that page. Case numbers prior to March 2007 may denote the year in two digits rather than four digits (example, C14 - 04 - 0001 rather than C14-2004 - 0001). SMART Housing suffix .SH (example C14-2012-0001.SH or SP- 2012 -0001.SH) may be attached to various types of cases: Zoning, Subdivision, Site Plan, etc.